The quacking of a duck startled me awake. It was more a honk actually. The first time I heard it in the middle of the night, it was a horrific sound. Because I couldn’t place it. I never expected to hear a duck in the middle of the night where I live. But we have a pool, and they like to land in the pool sometimes. In the middle of the night, some of the sounds that are innocuous or even unnoticeable during the day trigger worry or fear. The creak of a stair. The weird sounds that fridges make when they’re cycling through their…cycles. A duck honking. The epitome of sound is music. I lie awake and listen for it. The chirping of crickets is the chorus of the night. But they have some accompaniment. The distant barking of a dog, answered by another. Engines revving, droning or trumpeting, as cars pass by on the nearby cross street. The sounds begin to sooth me. I slip off into sleep. Whether one considers the science of sound or the magic of it, there is no denying that we are affected by the sounds we hear throughout our lives. And the sounds that affect us change as we grow, as we age. Even after I found out that the sound I heard when I put a seashell against my ear was the rushing of the blood in my own head, I still pictured waves breaking and the ocean crashing in that shell. Even after I was taught about air pressure and sound waves and what is actually happening when the wind “howls,” I could still make out the mournful cry of a spirit upon the wind. Even after hearing them again and again, some sounds are transcendent, like the first fifteen seconds of the most beautiful song you’ve ever heard in your life—whatever that might be at any given moment. Because there is the phenomenon of sound, and there is the phenomenon of its effect upon us. To harm or to heal. To alert or to soothe. To crush the spirit. Or to raise the spirit far beyond the heavens. I’m not a musician, or a physicist. I’m not a sound engineer. I’m in no profession where I study sound. I’m not someone who hasn’t been able to hear and has suddenly gained the sense. I’m just someone who has started noticing sounds. Appreciating them. Why? It started with my birthday present. A visit to the Archaic Civilizations and Empires Museum. I don’t typically enjoy guided tours, but was told that there was a particularly knowledgeable docent who gave the tours scheduled at ten and two. We were walking through an exhibit of very rich-looking pieces of flatware that once belonged to a family of treasure-hunters. One simple piece made of clay and metal caught my eye, but I wasn’t the one who asked about it. A teenaged kid in the back of the group asked. And when he did, there were sighs from some among the group. He’d been asking questions all along. Good ones. But ones that required long explanations from the docent, Carmen. The smile she smiled whenever he asked was sincere, as was my inner smile. I got to hear all her explanations without having to speak up myself. The first question he had asked was how the museum made sure the art and artifacts it housed were not stolen or appropriated. There was still plunder among their collections, Carmen admitted, but the museum’s recent curators were active in investigating ownership claims, and restoring as many items as they could to the governments, people, or families to whom they rightfully belonged. Some donors had dropped off, fearing that the museum would lose the best part of its collection. But others stepped forward, and those days, the museum was doing well, well enough to afford docents like Carmen. She was indeed quite knowledgeable. She told us briefly about the piece, the clay and metal plate, then added that if we were willing to indulge her, she could go into further detail about the piece’s history, or rather, its legend. There was some shuffling among the group and Carmen seemed to sense that most folks were ready to move on. She told the teenager that she could wait around after the tour and tell him about that legend if he was still interested. I had intended to ask if I could join them then, but the sounds that came out of my mouth did not follow that intention. “Actually, I would like to hear the legend too,” I heard myself saying. There was a sound; it was called the “keynote.” And just as a keystone holds all other stones in place in an arch, the keynote held all other sounds in place in the world. The keynote was also the sound from which all other sounds emerged. Even those who cannot hear experience sound in some way. They feel the beat of their own hearts or the rumbling of thunder in their skin and their bones. There is movement in waves of sound, sometimes subtle, sometimes profound. But without the keynote, there would be silence in the world. True silence. Long ago, when the world was young, the keynote, made by whatever hands and forces made all, was guarded by the mysterious watcher of all sounds. The watcher had knowledge of each and every sound emanating from the keynote, from the imperceptible sweep of a feather dropping to the ground to the bone-grinding roar of a tiger. The watcher heard but did not understand the sounds. The watcher was made this way, so as not to be swayed by either good or evil, by cries for aid or threats of torture. The watcher had but one task and one fate, to forever guard the keynote. Sound was different in those days. While it did pervade the world as it does now, when it was captured, it was truly captured. And once captured, it could be held so that none other could hear it. One could pluck the song of a canary from its throat as one might pluck a feather from its coat. And so there were many people who collected sounds that delighted them or were rare and precious. Yet the world continued to know sound, for even if one canary lost her song, all other canaries would still sing. Then came the day that a mighty empire rose in the center of the world, between north, south, east, and west. And it was ruled by a mighty emperor, who loved to collect treasures that delighted his senses. He traveled his empire, partaking in the finest food and drink. He had his gardeners grow the most beautiful and fragrant of flowers, the long-lost honeyed magnolia. His weavers wove clouds of cotton and strands of silk into robes so soft and light that the emperor felt as if he were walking about in his own skin. And he collected the most rare and precious sounds. Sounds that no other man, woman, child, or beast in his empire had ever heard. The mewling of a baby basilisk. The startled utterance of a profanity by the goddess of innocence. The trumpeting of an earthworm herald as it announced the coming of its army. Still, the watcher of all sounds was not troubled, for even these rarest of sounds had their equal somewhere in the world. But as was the watcher’s charge, the watcher watched. One day, the emperor was entertaining guests from a faraway land filled with strange and mystical beings. He boasted of and let his guests partake of his many treasures. And they were awed indeed by the beauty and fragrance of the honeyed magnolia, by the unequaled luxuriance of the emperor’s robes, and of the exquisite flavor of his wines and cakes. But in the realm from which they had traveled, the sounds he presented to them were all too common. For there, earthworm nations were always at war. Goddesses both virtuous and mischievous uttered profanities. And litters of baby basilisks mewled in almost every cavern in every mountain. So the emperor, unable to impress with the rarity of his collection of sounds and peeved with his guests, next presented the most frightening sounds he had. The blood-curdling screams of a mountain lion. The rattling of wood and the shattering of glass captured during the descent of a tornado upon a barn. The gentle but menacing whisper of the ghost that had haunted the emperor’s very own palace for centuries before he silenced it by capturing its voice. Still his guests were unimpressed. And the emperor, growing angrier, thought to impress them by presenting the most beautiful sound he had ever captured. For surely, they would be so mesmerized by the sound that they would not be able to utter any sounds themselves, save perhaps the sounds of ecstatic gasps. As it was released, the sound began to bloom. The emperor himself and his guests did indeed stand mesmerized. The emperor had first heard the sound when he was but a child. Trickling down from the mountains in the south as if condensing from the crown of clouds, came the bittersweet note, the chord that clutched his heart, the music from a singular lute. The lute, the only one of its kind, was carved by the hand of the wisest man in the empire. 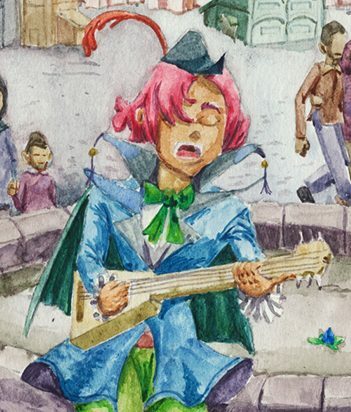 When that wise man began to sing that day, his creaking wavering voice broke the spell that the lute had cast upon the boy-emperor. The emperor had frowned. That evening as he slept, he could not stop thinking about the lute’s perfect music, marred by the wise man’s awkward and common singing. He was captured by the sound of that lute. And just as the sound had captured him, he captured the sound. And kept it forevermore. It was the first sound he had ever captured, and still the grandest. Or so the emperor believed. When the lute’s music stopped playing, his guests believed otherwise. The emperor, having reached the limit of his patience at last, challenged his guests to prove themselves. For he had presented all these wondrous sounds. They had presented only claims. His guests conceded that they did owe the emperor an extraordinary sound, and they had one that was rare and beautiful. Moreso, they claimed, than the emperor’s enchanting lute. Then, one among their number stepped forth. She was a child among their people, but she was as tall as a woman would be among the emperor’s people. She was stout of form and gentle of expression. Her ears were a bit longer than those of his other guests, but otherwise, she did not appear unique among them. She bowed deeply to the emperor, lowering her eyes and then her head. She rose from her bow slowly. The emperor crossed his arms. He would allow this interloper to sing, and when she was finished, he would, no doubt, be as unimpressed with her as she and her fellows were with his captured lute. She opened her mouth and began to…why, she began to sound. It was a strange song. It was music without melody. It was like the sound of a thousand choruses, a thousand rarest-of-lutes, thousands upon thousands of songbirds, and the jolly laughter of all who had ever laughed and ever would laugh. And all of it, somehow, was in harmony. The sound was unrelenting in its magnificence. It was fathomless in its generosity. The emperor felt tears dripping from his eyes. He could do nothing to stop them. He felt his heart being rent and sewn back together, cracked and repaired, stretching and contracting, beating and throbbing and aching. At last, he dropped to his knees. He relented. “What is that sound?” he asked, breathless and weeping. His guests were kind and gentle with the emperor. They helped him to his feet and told him the name of the sound. It was called the keynote, they said. They told the emperor the truth. They told him why the keynote must be protected. And they told him of the watcher of all sounds, who was not among their number. It was the watcher who sent them, entrusted them with the keynote, so that they might entreat the emperor to let his quest be. The watcher had listened as the emperor collected his sounds. As his collection grew, the watcher became wary and troubled by it. There were many in the world who captured sounds that they should not capture. Many whose collections displeased the watcher. But none among those had tilted the balance of sound within the world. None had disturbed the keynote, until the emperor grew and grew his collection. They had hoped that by letting the emperor hear the ultimate sound, the keynote, they would find him moved enough to stop his conquest of the senses, or at least the sense of sound. The emperor was indeed moved by the keynote. He was moved to a prickling curiosity. He asked about the keynote. How was she—or it—made? How did it make all the sounds in the world? And how could he be causing any harm to something so powerful? To him the keynote appeared mighty, mightier than any being standing in the chamber at that very moment, including the emperor himself. Captured though the sounds may be, the emperor claimed, they had not vanished altogether from the world. And that was when his guests told him something that he had not known, though he should have guessed. The sounds he captured would not sound forever. For in time, all things fade. The honeyed magnolias in his garden withered and died, and new ones had to be grown. His delicate robes frayed and tore after he’d worn them a few times. Food and drink once consumed were gone forever. And so it was with the sounds he had captured. Each time he released a sound so that he and others might hear it, a bit of the sound was lost for good. The emperor’s collection was so vast, and other distractions so ready, that he had not yet exhausted any single sound. But the day would come when he did. Other collectors had discovered the truth, but because they did not wish for their collections to lose value and prestige, they said nothing, and pretended to be precious and haughty with any who might ask to hear what could no longer be heard. Upon learning the truth, the emperor was again moved. Moved to rage and to despair, and he might have cast his guests out and roared through his palace, if it were not for the other emotion that moved him, burned within him. Desire. His guests had brought him dire news indeed. Unbeknownst to him, their arrival had heralded the end of his collection of sounds, but so too had it heralded the beginning of a grander collection. A collection of one that contained all. The emperor contained his despair and his rage, told his guests he was troubled by their news and must dwell upon it, set his servants to entertain and provide for his guests all that the palace had to offer, and retired to his private chambers. There, he pondered and plotted. He summoned his favored craftsman, the one who had crafted all his sound traps. For he knew what he must do. All the sounds in his collection would one day fade, but it would not matter. He need not preserve them. He need not capture any more sounds. For he would soon have the means to create any sound he should ever desire. He would soon capture a sound that would never fade. But such a powerful sound as the keynote would not be easily captured. His guests awaited an answer from him, and the emperor begged for their indulgence while he ordered the construction of the most powerful sound trap ever built. For to that time, he was the most powerful ruler the world had known. He had at his disposal many crafters and sorcerers, architects and thinkers, makers and molders. Together, they made a trap that was so common to look upon that the emperor almost flew into a rage. But his favored craftsman entreated the emperor to look upon the trap, a simple plate made of clay and metal, the finest clay and metal, but only clay and metal. There were spells etched into the plate, so finely they could only be seen if one peered carefully at them. There were mazes and labyrinths carved into the plate, again so finely and delicately that they could not be seen upon a casual glance. But those mazes were imbued with enchantments. The plate could certainly capture any sound in the world. But whether it could capture all sound, whether it could capture the keynote, was still to be seen. At last, when the plate was ready, the emperor had it set in the middle of his table, around which his guests would eat their final meal before departing his realm. He was to give them his answer about whether or not he would continue capturing sounds. The emperor felt both haughty and cautious. In his haughtiness he told his guests the truth—a part of it that is. He told them that he was much dismayed by their news that his collection of sounds would one day fade. There was one sound he still desired to capture, he admitted. But once he had that, he would stop capturing sounds for the rest of his days. When his guests asked him what that sound would be, he assured them that they would see him capture it before they departed. The emperor and his guests enjoyed a great repast. The plates were cleared away, all but the one in the center that had held no food but sat as a simple decoration. In his caution, the emperor grew nervous, for the moment of capture approached. While his guests chattered among themselves and with the servants, while their attention was diverted, while their wits were unguarded, the emperor sprung his trap. One of his servants pulled out a knife and stabbed the keynote’s arm. The keynote, who was otherwise silent, opened her mouth and cried out. It was not like the sound she had made when first the emperor heard her. This sound was horrific. Like a thousand mothers howling in despair for the loss of their children. A thousand hungry hounds snarling and snapping as they hunted. Thousands upon thousands of wounded and wailing beasts. The emperor clutched his chest in fear, forcing himself to toss a stone into the sound trap plate to open the trap. The trap was quick and it was complete. The horrific sound of the keynote’s pain was sucked into the plate, and following it, the echoes of other sounds, storms, the crackling of growing trees, the chirping of crickets, the songs of songbirds, and all the music in all the world. And the trap did not stop there, for any other sound made in that chamber was captured as well, including the cries of the emperor’s guests, and any servants who were innocent of the wicked plot. The keynote, or the girl who had once been the keynote, collapsed upon her chair. Many rushed to her aid. But one among the guests rose and before the stabbing servant or the emperor could reach the sound trap plate, this guest seized the plate. From the plate there burst a boom so powerful it knocked all who were present to their feet, and so painful that it made everyone clap their hands to their ears. The emperor struggled to his feet and as his hands came away from his ears, he saw they were dripping with blood, and there was an unbearable pain in his ears. He could hear nothing. The one who held the plate, the emperor’s trap, had not been knocked down. This guest walked toward the emperor, and held the plate forth. The emperor, incredulous, reached out, but stopped, his suspicion and caution overwhelming his desire. He could not hear anything, but he saw the sounds swirling around in the spells and mazes etched into the plate. The trap had worked. The keynote was captured. His desire overwhelmed his caution, and he reached for the plate. The emperor’s last act in his reign, in his mortal life, was to reach for the plate. For when he touched it, he was seized by all the sounds of the world at once. He did not hear them with his broken ears, but with his mind. And his was a mind that was not meant to hear all sounds at once. His other servants and guards were too frightened to intervene with the one who held the plate, the object that was now the new keynote. Even the servant who had stabbed the girl had dropped his knife and fled. What became of the girl was not recorded, but every kind storyteller told that the girl was taken back to her realm, nursed to health, and remembered nothing of her ordeal with the emperor, or of holding the power of all sound. The one who had claimed the plate—the keynote—was none other than the watcher of all sounds. It was the one lie that the emperor’s guests had told him. That the watcher was not among them. Some say that the watcher shattered the keynote, sending its power throughout the cosmos. From then on, no one could capture a sound, for all sounds were free. “But there are others who say the watcher kept the keynote intact, returned home with it, and continued to watch over it,” Carmen said. She turned her head to gaze purposefully at the plate contained in the glass case. “Maybe he’d even approve,” someone said. They looked at Carmen and she gave a mysterious shrug. “A cool-looking hunting horn,” someone else offered. After a momentary lull as everyone gazed at the common-looking plate, someone asked how something so important as the keynote ended up in that museum of all places. I chuckled, along with a few other people. Okay, so the keynote didn’t really exist, but if this plate really was a representation of the keynote from a time when people would have believed in it, then this was a very precious artifact. It was the centerpiece of a people’s myth about where all sound came from. Sound, one of our five fundamental physical senses. How did it end up here? I thought Carmen was going to go into the provenance of the artifact, or maybe another justification for why it wasn’t with the descendants of the people who made it. But for the first time, she didn’t actually answer the question. She joked. Just because you can’t see them, doesn’t mean the guards aren’t there. Something like that. A man lightly elbowed his wife and nodded over to a shadow in the corner where a serious-looking man in a dark suit, and sporting an earpiece, stood with his hands folded before himself. A few other people noticed and raised their eyebrows at each other. Then someone else in the group joked that the item they were looking at was just a replica. They had the real keynote in actual lockdown and were maybe studying it. Again, Carmen just smiled, shrugged mysteriously, and waved the group toward the next section of the museum. But I lingered as the group moved on. So did the teenaged kid and the young woman with the drawing pad. We peered at the object behind the glass. We were silent, but I guessed they were doing what I was doing, studying the chipped and dirt-encrusted plate for signs of etchings (or maybe for the shimmering swirl of captured sound). The young woman breathed in and scribbled something on her notebook with the distinct scratchy sound of a pencil. She moved away toward the rest of the group. A moment later, I exchanged a glance with the teenaged kid, who smiled at me, pulled one hand out of his jeans pocket, and pointed to the group. He too went to rejoin them. And I would too, but I just wanted to try something first. I leaned down a bit, closed my eyes, and turned my head so that my left ear was facing the plate. An intriguing and interesting tale!